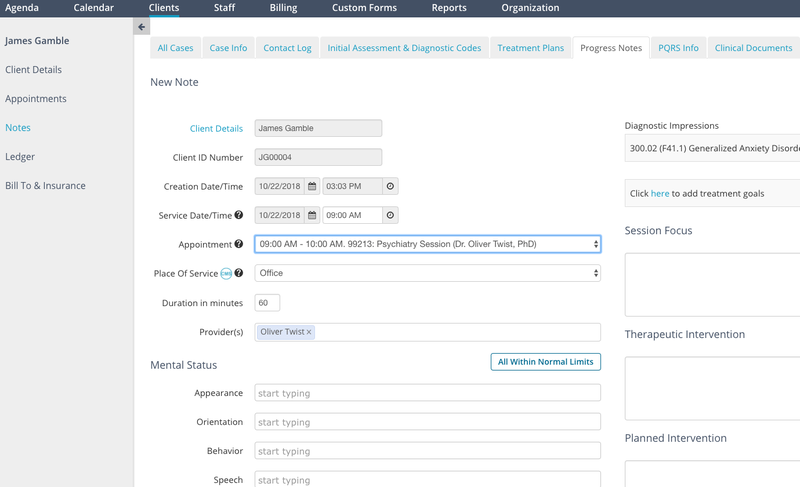 Please Note: The workflow for creating Notes is slightly different when a client has multiple cases and a therapist can access more than one case. We’ll discuss that below also. The first part addresses a single client with a single case, which is usually the case. 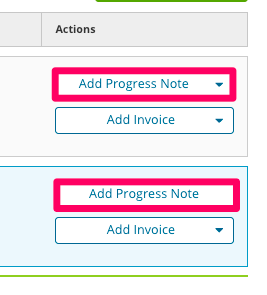 While you can create a progress note at any time by clicking “ Notes” next to the client's name on the client list, the easiest way is to tie the note to a specific appointment by starting from the Agenda. Once an appointment is scheduled, it will appear on the Agenda (like the one shown above). If the appointment has passed: Use the Missing Progress Notes Repot to find all sessions that are missing a Progress Note. Or simply go to the desired date in the top left corner of the Agenda. Click "Add Progress Note" on the Agenda and you’ll be taken to the notes section for the client, and automatically placed in a new Progress Note with the date and time of the session shown. Select the therapist that completed the client's appointment to the right of Therapist(s). When entering information into the Mental Status and Risk Assessment areas, you can type in the fields and select from the list that appears, or enter in a new phrase. You’ll notice that Diagnostic Impressions from the Initial Assessment & Diagnostic Code tab and a History of Treatment Goals also appear. You can add or edit these by clicking the Treatment Plan tab or the Initial Assessment & Diagnostic Codes tab. Once you start typing in the note, a message will appear in the top right corner letting you know that a draft is being saved. If you were to leave the page without pressing the green Save button at the top right, you can still retrieve the note by clicking "View Draft Copies of This Note". Loaded drafts disappear after the note is finally saved. Click here to read more about document drafts in TheraNest. If the client has an existing note, you can use the existing note as a template. Click the Progress Note tab, and on the next page, click “+ Copy from Last Session”. This option will start a note using entered text from the previous session. Edit as needed to create the new note and save. What Happens When My Client Has Multiple Cases? Multiple cases for the same client are rare. Please make sure you have not mistakenly created multiple cases instead of new notes. When clicking "Add Progress Note" from the agenda you'll be presented with a case window where TheraNest will ask you wish case you wish to write a note for. If you’ve mistakenly created multiple cases, click Notes under Actions on the Case Notes page to see the progress notes in each case. If you have entered notes mistakenly in an extra case, you can either copy and paste them over to the correct case (on its Progress Notes tab), or pull a PDF of those progress notes to upload into the client's Clinical Documents section. Then you can delete the extra case. If you did intend to have multiple cases, select the radio button next to the desired case and click, "enter notes for selected case." We recommend that you name the cases to make it easier to know where your notes go. You can do this on the Case Info tab (first tab in the case note section) after clicking Notes. Now cases will show up with different case names in the case list to reduce confusion. To enter notes in any of the cases, click Details, and then click Progress Notes tab. Note: If you have multiple cases assigned to different therapists, each therapist will only see the case(s) assigned to them in this list and will not see other cases assigned to another therapist. While you can have multiple cases for a client, the Agenda can still be able to go directly to the appropriate case when you click Add Progress Notes on the Agenda. You can do this by appropriately setting the service type on the Case Info tab of the case (first tab), and the assigned staff under the Assig Staff tab of the clients main details/demographic section. Click the Case Info tab of the case and set the service type (optional). Click the Assign Staff tab in the client's main details/demographic section, and set the assigned staff for the specific case. Now when you set a schedule on the calendar, it will use the staff member assigned to know which case note to open when you click Add Progress Note from the Agenda. In the above case, it will open the progress note for case assigned to when you click Enter Note. However, if Dr. Jackson is assigned to both cases, it will go back to the Case List page. Setting the service type (if different) may then be required if you want the agenda to automatically go to the right note.